This American Metal Universal Oven Range Hood Filter Kit is a trim to fit grease range oven filter for use with many over the range oven hoods (ducted and non-ducted), microwave ovens, and all other similar applications requiring grease elimination. It filters grease and recirculates cooking odors when the oven is not vented to the outside. Additionally, this particular oven range filter can be used on many non-ducted as well as ducted range stove vent hoods which are entirely separate from the oven. 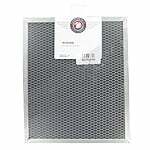 It can be used as a replacement filter for many microwave ovens as well. 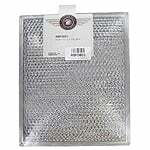 The RYM1518G Universal Oven Range Hood Filter Kit includes 4 frame rails, 1 trimmable expanded metal mesh pad, and 4 corner connector clips - instructions for use are included with the packaging. It is constructed with a dense layer of expanded aluminum metal meshing. 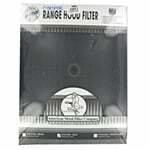 This oven and hood range grease filter replaces any filter up to 15" x 18" with a frame thickness as small as 11/32". Because this is a cut to fit oven range filter that is trimmed to the specific size you need, it has the ability to replace over 1,000 different filter sizes. 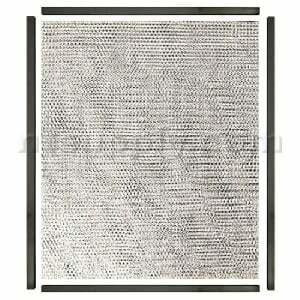 Dirty filters create more strain on your oven, range stove vent fan, and/or microwave which limits their lifespan. This cut to fit oven and microwave grease filter should be replaced every 9-12 months depending on frequency of usage. A universal oven range carbon filter for the removal of cooking odors is also available.